[audio:http://recordings.talkshoe.com/TC-11888/TS-206833.mp3] Evelyne takes us through the life of a wine from harvest to its debut at harvest ("birth") to being "raised" in barrels in the chai, bottled after 18-24 months, and finally reaching the shelves nearly 3 years later. In the meantime, it will be blended and tasted and nurtured. DaveAC has a few questions that bring out the best in her knowladge ansd the worst in my jokes. Château Palmer Marketing Director Bernard de Laage tells us about the lower 2008 yield (sorry about the cellphone noise). 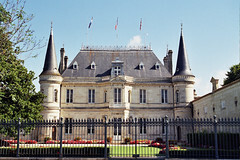 See Futures or Primeurs Week in Bordeaux post on her Wine Brands Blog. She talks about some surprising finds at tastings last week, including wines from... wait for it: Syria and Lebanon!